When I started to make German Potato Salad for dinner, the question, "Why do you want to mess with your recipe?" came up. Well, I am not really messing with my recipe, I am trying out one that was originally posted by Debby at A Feast for the Eyes. 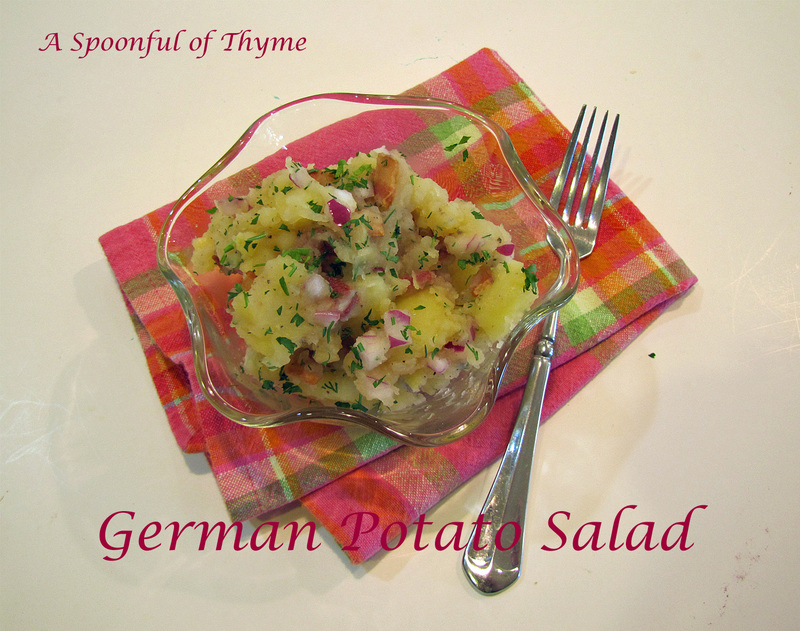 It is an authentic Bavaria style potato salad recipe made by her Mutti every morning at her delicatessen. 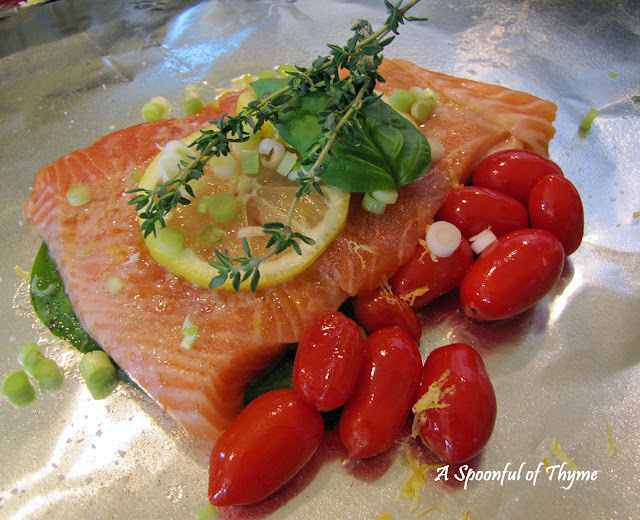 I was reminded that I had pinned this recipe when I saw the recent post by Cathy at Wives with Knives. It was a hit at Cathy's house and it was a hit at my house. Mr. T must have told me at least four times how great the potato salad was! That means, it is a repeat! Like Cathy, I have a German Potato Salad recipe that we like. In fact, it is the one dish that my dad would ask me to make for him. His family is from Bavaria also...his eyes would light up when I said I was making German Potato Salad. The recipes are similar but one has cooked onions and one does not. In my mind one is for fall and winter and the other is for spring and summer. One is served as a hot side and the other at room temperature...both delicious!! Cook the bacon until crispy. Drain on paper towels. Save about 2 Tbsp of the fat. Finely chop the bacon and set aside. Prep all ingredients first, as once you slice the potatoes you need to add the dressing to them while they are warm so that it is better absorbed. Boil the potatoes, skins on, until fork tender. Drain and allow them to cool slightly so that they can be picked up and held in a clean tea towel. Gently remove the skins. Cut each potato in half and then slice them fairly thin (about 1/4 to 3/8 inch). Place them into a large bowl. Add the bacon, onion and dill. Add the reserved bacon fat and chicken stock. Gently mix with a large spatula, being careful not to "mash" the potatoes. Add 1 tsp sugar, then additional salt and pepper, if needed. Add the parsley. Mix well. Prepare in advance to allow the flavors to meld. Serve at room temperature. 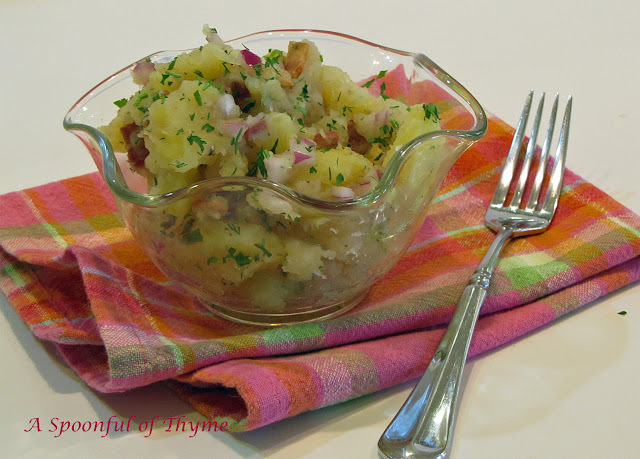 This is a lovely potato salad and without mayonnaise, it is great for summer picnics. Thank you Debby for sharing your Mutti's recipe with us.....and, thank you Cathy, for reminding me to make it!! Here are some other potato salad recipes that you might find fun. Another month as rolled around and it is time for The Secret Recipe Club. This month I made a very moist coconut pound cake that was glazed with a very yummy glaze and sprinkled with coconut! 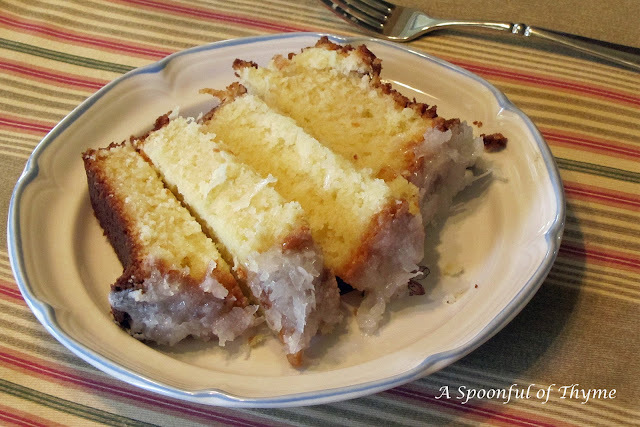 The recipe came from Lynn's blog, Cafe Lynnylu. Lynn's cake was beautiful as are all of the recipes on her blog...Lynn is a photographer par-excellence as well as an avid cook...need I say more? The cake was very moist with a wonderful flavor...who doesn't like coconut?! I did make a couple of slight changes. The liquor store did not have any coconut liqueur. He said that it was very difficult to come by...I will keep looking for the future...I used coconut extract. I didn't have any milk so I substituted sour cream....mmmmm. Preheat oven to 335° F. Grease and lightly flour a 10 cup tube or bundt pan. Set aside. Whisk flour, baking powder and salt together. Set aside. In a separate bowl, cream butter and sugar then add eggs one at a time beating between each addition, until light and fluffy. Add sour cream, coconut, coconut and vanilla extracts, mix well. Add flour 1 cup at a time, mixing just to incorporate. Pour batter into prepared pan. Bake about 1 hour and fifteen minutes or until golden brown. Test the cake at one hour for doneness. When done, remove from oven and let cook for 15 minutes before turning out on a rack to cool. 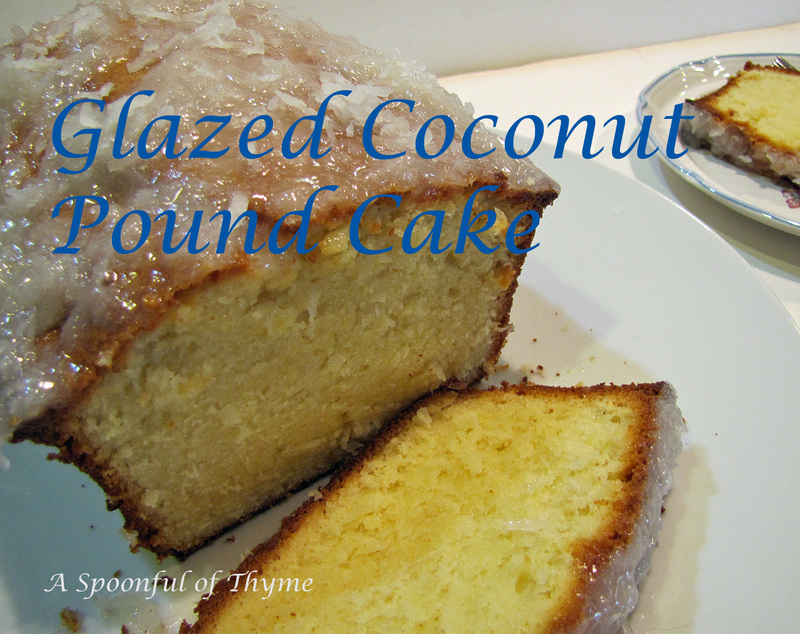 Meanwhile, make the glaze by combining the confectioner's sugar, coconut milk, vanilla or coconut extract. Mix in the coconut. Pour glaze over the cake. 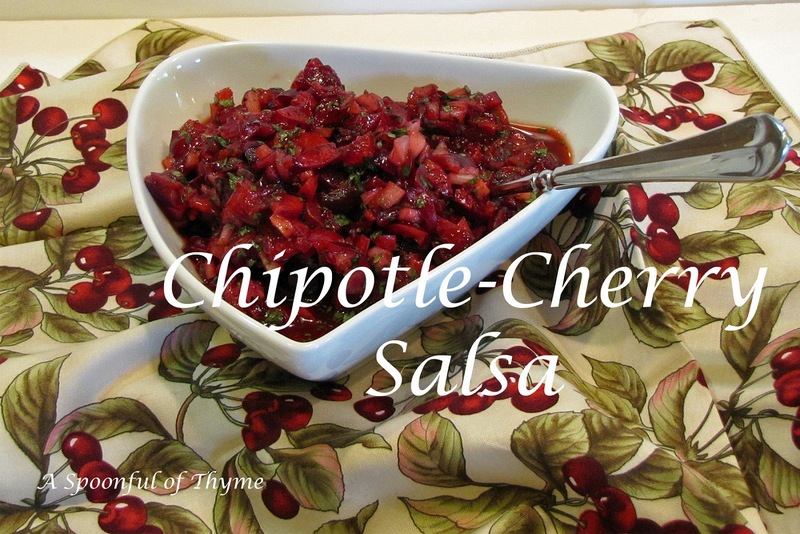 Chipotle-Cherry Salsa....the end of the cherries! I had never thought of making a cherry salsa but on my quest for cherry recipes, I found one that is credited to Mark Bittman and can be found in his cookbook, How to Cook Everything Vegetarian. The combination of smoky chipotles and sweet cherries intrigued me....and there were just enough left to give it a try. We weren't disappointed and we were ever so happy to have leftovers!! 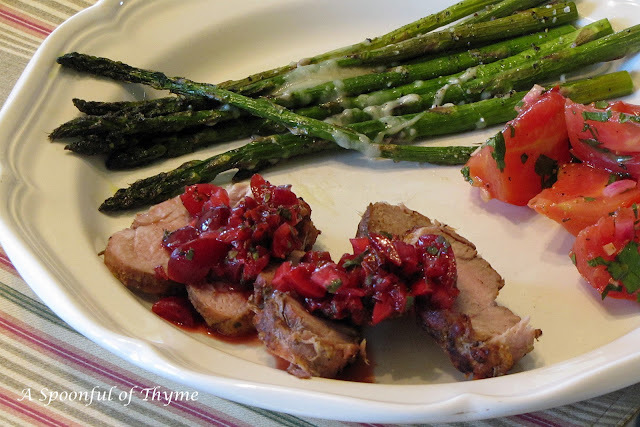 We served the salsa with pork tenderloin that had been grilled. The tenderloin had been rubbed with Big Dude's recommendation, Head Country All-Purpose Championship Seasoning. It gave the tenderloins a nice, light smoky flavor. Mmmmm gooood! Put all of the ingredients in a medium bowl and stir to combine. Let sit for 5 minutes, then taste and adjust the seasoning, adding more chile, lime or salt as needed. Serve at room temperature. The salsa may be covered and refrigerated for up to two days. Wasn't that simple? We thought it was really tasty....and, this marks the end of the cherries! Enjoy!! Yes, there are more cherries. One would think that I would run out...and, sadly, I have just about exhausted the supply! 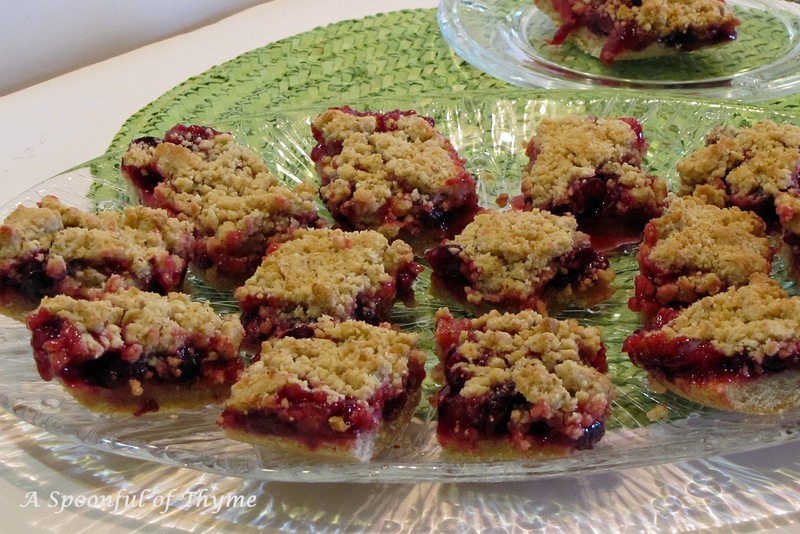 The recipe came from a cookbook that I shared last year, Rustic Fruit Desserts by Cory Schreiber and Julie Richardson. This is a really nice book featuring, crumbles, buckles, cobblers and more! I did make a change in the recipe in that I added almond extract....I really love cherries and almond together. Preheat the oven to 350° F. Butter a 9-inch square baking dish. To make the fruit filling, combine the cherries, sugar, cornstarch, salt, lemon zest and lemon juice in a saucepan over medium heat. Bring to a boil, stirring occasionally, and boil for 1 minute to thicken. To make the crust and topping, combine the flour, brown sugar, almonds, and salt in the bowl of a food processor. Add the butter and process until crumbly. Add the egg and vanilla and pulse just until the mixture comes together. Press two-thirds of the mixture into the bottom of the prepared pan, then pour in the cherry filling. Crumble the remaining crumb mixture over the filling and press lightly. Bake in the middle of the oven for 30 to 35 minutes, or until light golden brown and bubbling around the edge. Cool for 1 hour before cutting into bars. Storage: The bars will keep up to four days if stored in an airtight container at room temperature.